A rendering of the renovated CUB when it’s completed with a wall of glass along the east wall of the Commons dining hall. The Campus Bookstore and Post Office will move temporarily to Griffith Hall later this month as workers get ready to begin a $30 million renovation and expansion of the Carlton Union Building. The 59-year-old CUB needs remodeling and must be expanded to accommodate the recent increase in enrollment from 2,100 to more than 3,000 undergraduate students. Over the coming years, the Commons dining hall will be enlarged and a wall of glass will be added across the east wall, providing a scenic view of green space and an exterior patio dining area. A student lounge and spaces for student organizations, the Student Government Association and the Center for Community Engagement will be constructed on the second floor of the north wing. The faculty will continue to have a lounge area in the building. 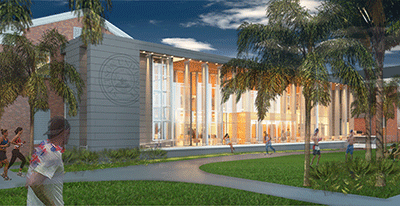 A new, larger bookstore will open downstairs and be connected to a convenience store, copy center and the post office, said Al Allen, associate vice president of Stetson University’s Facilities Management. Stetson President Wendy B. Libby, Ph.D., said the CUB desperately needs the improvements to better serve students, provide sufficient space for the larger student body, and have the student organizations and services in one location on campus. The bookstore and post office will close later this month and reopen in Griffith Hall on Monday, Oct. 31. The bookstore will be impacted the week of Oct. 24 and will be closed for a few days before reopening on Oct. 31. The post office will move without affecting operations. The two temporary locations will remain in use until August 2017, when the first floor of the new north wing is finished. This March, the Coffee Shop will close and reopen temporarily in the office space on the first floor of the CUB now used by the SGA. The SGA office will move temporarily to a new location, which hasn’t been finalized yet. “Outside of the Coffee Shop changes that will take place between Spring Break to when classes end, there isn’t that much change this year that will affect students,” said Lua Hancock, vice president of Campus Life and Student Success. Students have been involved in the project from the beginning, she said, and a student committee has given input on everything from the design of the building to the furnishings. Construction will begin on the CUB’s north wing in mid-November, after the bookstore and post office move temporarily to Griffith Hall. By June 1, workers also will construct a temporary kitchen building east of the CUB and north of Conrad Hall. The temporary kitchen will be in operation for 18 months and will be a fully operational industrial kitchen that maintains strict food safety and sanitation requirements while providing the same amount and variety of food options currently offered, said Lindsey M. Bishop, director of Marketing and Guest Experience for Stetson Dining Services. For the 2017-2018 academic year, meals will be prepared in the temporary kitchen building and served from the area where the Coffee Shop is located today. The seating area will remain in the current Commons during that time and no seating options will be lost during the renovation, she said. The temporary kitchen will be in use until August 2018 when the new Commons opens. The Hat Rack Cafe, including Einstein Bros. Bagels and Johnny Rockets, will not be impacted during the project. Funding for the project is coming from a combination of fundraising and the university’s operating budget servicing debt used to renovate the building. “I just want to reassure the community that quantity, quality, diversity of choices for their dining will not change throughout the whole project,” Hancock said. Once completed, the new Commons will be “greatly expanded,” with a glass wall along the back overlooking a covered patio and landscaping to the east. Inside, the ceiling will be two stories high and the food serving areas will look into a new, expanded kitchen, said Allen with Facilities Management. Al Allen, left, associate vice president of Facilities Management at Stetson University, and Matt Adair, director of Project and Construction Management, talk about the plans for the Carlton Union Building renovation and expansion. But the historic look of the front of the CUB – with its brick and stately white columns – will not change. Jeff Hahn, president of the Student Government Association, agreed and said the renovation easily had the “ability to ruin the Stetson mystic.” Instead, college officials and the students who provided input made sure the building tied into the overall feel of the DeLand campus. A senior majoring in Political Science, he shares “the excitement that all of the students are feeling” about the new CUB, although he’s “disappointed” that he will graduate before the project is finished. “The students who know about the project and who have been to the presentations or online to see the mockups, they think it looks really cool,” he said. Eventually, the SGA will move to the new second floor of the north wing. It will join a student lounge, the student radio station and other student media space, a multi-purpose meeting room and Offices for Community Engagement, and Diversity and Inclusion. The Cross-Cultural Center, however, will not move into the CUB and will remain in a separate house for students to use, Hancock said. Through 2019, other areas will be renovated, including the lobby, faculty lounge and Stetson Room. The Stetson Room will remain the same size and have a corridor running down the length of it that overlooks the dining room below, Allen said. The overall project reflects the amenities and services that students have come to expect today, said President Libby.